What's the Difference between Symptoms of Pregnancy and Menopause? When you enter perimenopause, there are a number of signs and symptoms that will make it obvious that your body is going through a change. However, it's important to remember that some of these bodily changes are also the classic signs of pregnancy. How can a woman tell the difference between symptoms of pregnancy and menopause? Learn more about menopause and pregnancy symptoms here. The classic sign of pregnancy is a missed period, but many women in their forties and fifties wonder if a missed period is actually an early sign of menopause. The easiest way to answer this question is by taking a home pregnancy test or a blood test. However, do not take it too early, as it's easy to get an inaccurate result if the body hasn't yet produced enough pregnancy hormones to be detected. 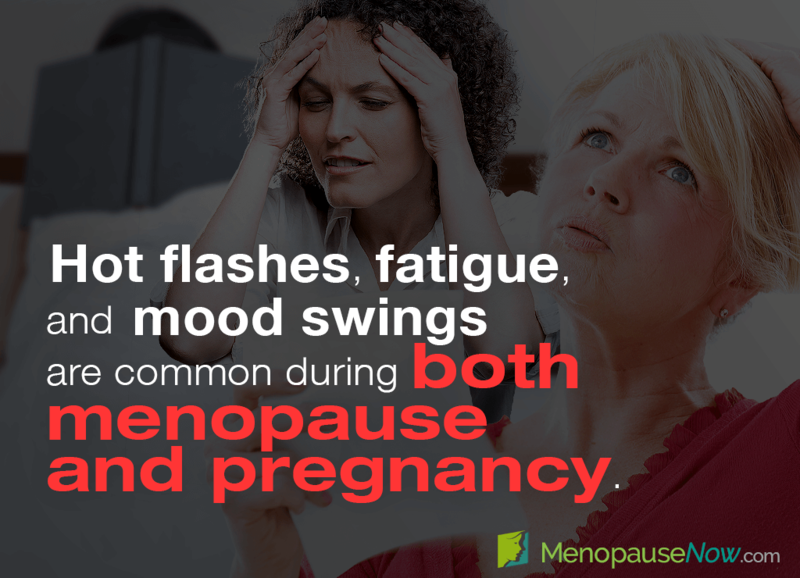 Experiencing mood swings can be related to premenstrual syndrome (PMS), menopause, or pregnancy. Hormones (i.e., estrogen and progesterone) interact in similarly erratic ways during all three of these times. As a rule of thumb, mood swings that are rooted in decreased hormone levels are often triggered by external factors, such as a bad day at work or stress over a family problem. Extreme fatigue can occur during menopause as a result of insomnia, night sweats, anxiety, and a host of other symptoms. As with mood swings, fatigue is often worsened by external factors. When a woman is pregnant, she may feel more tired during the first trimester as her body prepares to nurture the fetus and adjusts to the vast amount of hormones present. Most people think that hot flashes as a symptom of menopause, but the truth is that pregnant women can get them, too. Especially during the first and third trimesters, the drastic changes in hormone levels can cause a woman to have hot flash episodes. If your pregnancy test results are negative, but you suspect you are too young to be experiencing menopause, it's important to visit a doctor. There are many underlying conditions – such as polycystic ovarian syndrome, anxiety, panic disorders – that could be the cause of your symptoms. If you are in the age range for menopause, then it's most likely that you are experiencing the first signs of it. Click on the following link to learn about how to deal with menopause symptoms. Q&A: What Happens to My Hormones during Menopause? Worried about what menopause has in store for you? Have no fear - take a look at this article on what to expect during this stage. The length of menopause varies drastically from woman to woman and some may feel as though this phase will go on forever. Here are tips for stress relief. Menopause is a time of transition when a woman goes from being reproductive to being infertile.